From our collection of Nativity Sets, Pieces, and Creches, is this Made in Italy One Piece Set in Resin Plastic. 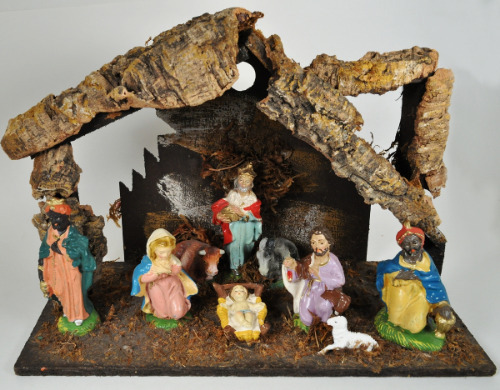 In very good condition for it's age, this is a one piece nativity with all pieces attached to the creche itself. Complete with the hole for a decorator clamp on light, the creche itself is very authentic looking with natural woods and mosses. 9 total pieces are attached with Made in Italy plainly stamped on the back. IMPORTANT SHIPPING NOTE: This will ship Very carefully packed USPS Priority Mail for faster and safe delivery to you.